We believe that when cultural organizations and local businesses work together, amazing things can happen, but too often, each sector operates independently, unaware of the incredible missed opportunities for creating connected communities right in front of them. One element of our new Be Here: Main Street (#bHereMainSt) partnership with the Smithsonian’s Museum on Main Street program is to encourage GLAMS to reach across the proverbial isle, bringing together community museums and libraries with businesses, from restaurants to hardware stores and gift shops. Why would this be an imperative? A tourist arrives for a bite to eat, has a nice meal, and asks the waitress what she should do in town. The waitress recommends the local museum. In fact, there is a brochure and postcard for the local museum at the cash register that she promptly returns to the tourist. The visitor then walks to the museum and, in turn, chats with museum staff about any local stores that might sell a speciality item. The visitor receives an impassioned endorsement about a local antique shop that might have her desired object. This scenario plays out organically on main streets and towns across the world, but more often than not, it’s a random series of one-off conversations. What if that collaboration between cultural organizations and local businesses was well crafted? What if the museum offered a coupon for lunch at restaurant A, and restaurant A offered a 10% discount for the museum’s gift shop? What if the same restaurant offered lunchtime lectures from staffers at the museum? What if both the restaurant and the museum were included on a tour of the town? What if, now this is REALLY crazy, the museum actually featured some of the stories of the local business owners? Or, even crazier, if the restaurant’s menu was inspired by the collections at the local museum. We could go on and on . . . 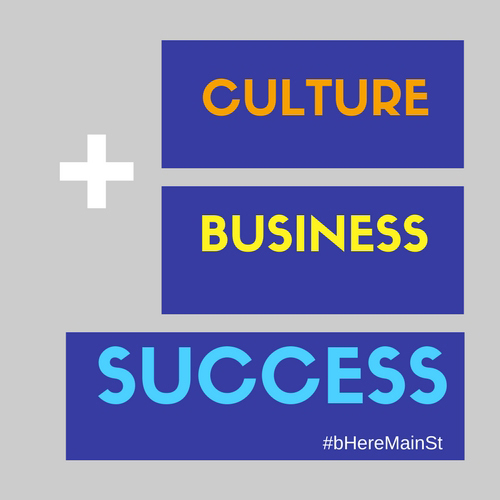 These are all things we’d like to see transpire through the Be Here: Main Street project. But, there has to be a first step, and that initial step is just to make conversations happen. 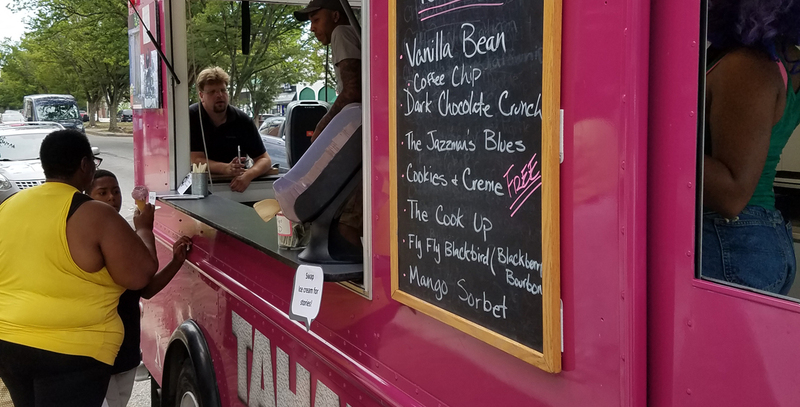 Here are a couple of tips for getting businesses involved with your community project, provided by Julie Heath, Director of Strategy & Partnerships at Conservation Center for Art and Historic Artifacts. Identify the top 20 employers in your town. These are the businesses that rely on your community as a source of talent, for services for their employees, for word-of-mouth reputation, and for civic buy-in regarding their presence and growth. They likely want to be seen as part of their community. Make a two-column list: One column “B2B” and one column “B2C.” Sort each employer into the appropriate column by asking, “does this company sell its product or service to other companies or to individual people?” If a company sells to companies, its business model is called B2B (business to business). If it sells to individuals, it’s called B2C. It’s important to understand that an employer may have different relationships with its community based on its business model. Your job as a community partner or sponsored prospect/recipient is to determine what type of relationship(s) that company wants to have with its community. B2B businesses’ products and services are sometimes less obvious to the community member than B2C products and services. B2B businesses sometimes have higher profit margins than B2C businesses. These two factors together can make B2B businesses better sponsorship prospects, provided you can figure out who you should speak with at the company. Part II of “Business and Culture” is coming next week. Until then follow posts about our project using the hashtag #bHereMainSt.